Harnessing 3D for the benefit of healthcare professionals ! 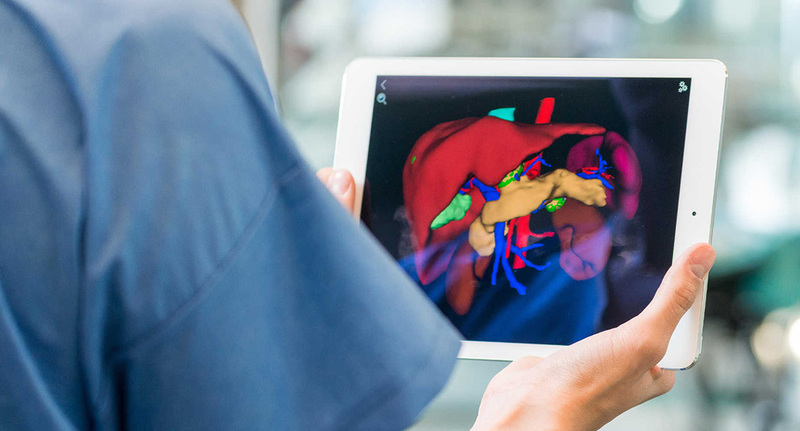 Visible Patient gives healthcare professionals the opportunity to model their patients’ organs in 3D to assess whether surgery is required and, if so, to refine the preoperative diagnosis. Combined with the La Poste eHealth app, this innovative solution also improves post-operative patient follow-up. Led by Luc Soler, the scientific research director of IRCAD (Research Institute against Digestive Cancer), Visible Patient is the result of 15 years’ work by the institute. The start-up now has about 20 employees. Through 3D modelling of the organs to be treated, Visible Patient helps health professionals establish a diagnosis and allows them to have discussions with the patient based on an interactive 3D image. Harnessing 3D for the benefit of healthcare professionals ! Performed by Visible Patient using a scanner and/or an MRI, 3D modelling of the organs enables practitioners to examine them from all angles, to confirm a diagnosis and better prepare for surgery. It is also a very effective communication support for discussions with the patient, as well as with other practitioners. Using free software, reserved exclusively for healthcare professionals, a model can be transmitted to a colleague for an opinion. The security and confidentiality of the data are guaranteed by Visible Patient thanks to the partnership that the start-up has formed with Docapost, a subsidiary of Le Groupe La Poste, France’s leading health data host. The La Poste eHealth app has real advantages over all existing e-health apps. It’s the only one to offer a dedicated section for healthcare professionals. Visible Patient has also enhanced its solution by giving the practitioner the opportunity to view information in the patient’s “digital health space”, accessible via the La Poste eHealth app. This free app allows the patient, practitioners and healthcare institutions to exchange information (secured by Docapost), such as blood group, vaccines, height/weight, medical imaging analyses and results, current treatments, surgical procedures, etc. – all information enabling better patient supervision, whether at the diagnosis phase, before/after surgery or during treatment. The app even collects data transmitted by compatible connected objects (scales, blood pressure monitor, glucometer, etc.) and stores it in the patient’s digital health space where it is accessible to the GP. Visible Patient and La Poste eHealth – the winning combination that simplifies the lives of healthcare professionals and their patients!